The first World Championships were held in 1949 for men and 1952 for women. Volleyball were first introduced as Olympic sports in 1964. 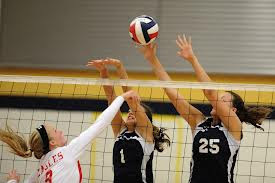 Volleyball took some of its characteristics from tennis and handball. The first two-man beach game was played in 1930. The sport is not only played in high schools and colleges throughout the USA, but is featured in the Olympics and international tournaments worldwide. Volleyball facts trivia covers the rich history of interesting facts, figures and people of the game. Although it's a surprise to many people, volleyball is the second most popular sport in the world today behind soccer. It is played all across the world and in many different forms of competition. The game takes many of its characteristics from other sports that were popular at the time of its inception, such as handball, badminton and tennis. The Volleyball Hall of Fame is located in Holyoke, Massachusetts. The location was chosen because the game is believed to have been invented at the YMCA in town. A fun piece of volleyball facts trivia is the dispute about who made the first official volleyball. Some say the first ball was made by Spalding in 1896, but many other companies want to put their name on this sport's history as well. Volleyball owes a lot of its growth in the 1940's and 1950's to soldiers in World War II. The YMCA taught the sport to soldiers placed in Germany, Italy and Japan in order to help spread Christianity worldwide. The soldiers also taught the sport to their friends and family when they returned home. Some volleyball facts trivia are poetic, such as Yasutaka Matsudaira being quoted as saying that volleyball is like an orchestra sent from heaven. Matsudaira won 3 gold medals for Japan. Beach volleyball first started springing up in Santa Monica, California during the 1920's. At first, the game was played with six players per side, but beach volleyball was forever changed in 1930 when Paul “Pablo” Johnson decided to play with just two men on each team. The first professional beach volleyball tournament was called the Olympia World Championship of Beach Volleyball. It took place at Will Rogers State Beach during late summer in 1976. Al Scates is the first college volleyball coach to reach 900 wins. Scates is the current coach of the UCLA Bruins and has won 19 NCAA championships. He has also won coach of the year 5 times. The Floater serve is very similar to a knuckle ball in baseball. Its unpredictable movement can cause the opposing team to fall over trying to hit it. According to the Guinness World Record, the longest game of volleyball lasted 55 hours as a support to homeless people in Lexington, Kentucky. The first special designed ball for the sport was created in 1900.